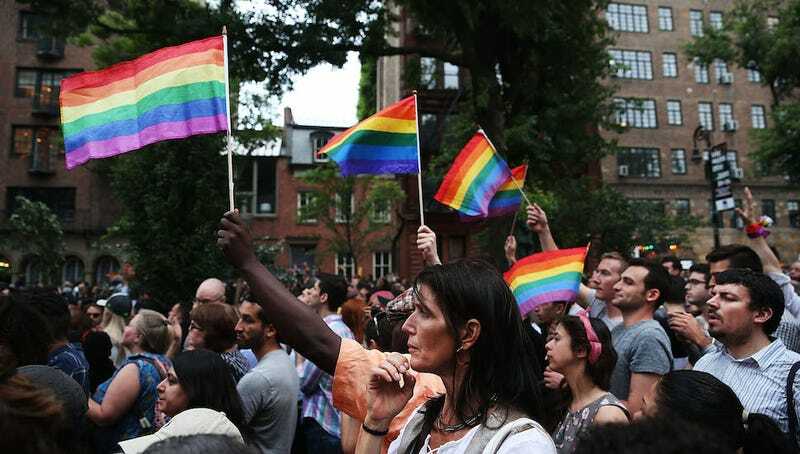 This evening in New York City, mourners gathered outside the Stonewall Inn, paying candlelight vigil to the victims of the mass murder at Pulse in Orlando. On the morning of Sunday, June 12, hundreds converged on the historic site to pay respects with words, flowers, signs and candles, but Monday night called for a citywide meeting organized by local activists and New York Mayor Bill de Blasio and First Lady Chirlane McCray, in which the mayor, McCray and others read the names of each known victim of the shooting. Jezebel’s JE Reich was there, and estimated that a few thousand were in attendance. She said that as city leaders read the names, the crowd responded, “Presente”—a statement of tragic unity, and a reference to the fact that attendees had been at Pulse for a Latin night, and that the majority of victims were Latinx. Meanwhile, in Jackson Heights, NYC Public Advocate Tish James read victims’ names as a somber prologue to the neighborhood’s annual trans Latina march. After sunset, Stonewall ended with a dirge.